Egerton, Frank N. 2014. 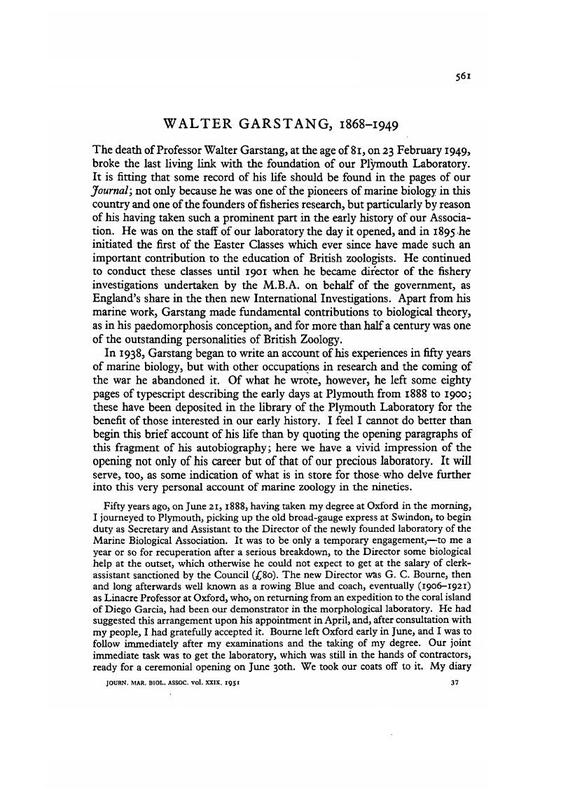 History of Ecological Sciences, Part 51: Formalizing Marine Ecology, 1870s to 1920s. Bulletin of the Ecological Society of America, Vol. 95, Issue. 4, p. 347. Maderson, Paul F.A. 2004. Born in a follicle—a historical perspective. Differentiation, Vol. 72, Issue. 9-10, p. 466. Young, Craig M. 1990. Larval ecology of marine invertebrates: A sesquicentennial history. Ophelia, Vol. 32, Issue. 1-2, p. 1. Southward, A. J. and Roberts, E. K. 1987. One hundred years of marine research at Plymouth*. Journal of the Marine Biological Association of the United Kingdom, Vol. 67, Issue. 03, p. 465. Russell, F. S. 1963. The Plymouth Laboratory of the Marine Biological Association of the United Kingdom, 1963. Journal of the Marine Biological Association of the United Kingdom, Vol. 43, Issue. 02, p. 281.